SAN FRANCISCO — Although the Louis Vuitton Cup challenger series started July 7 it was not until July 13 that two of the three challengers for the America’s Cup were on the race course together. 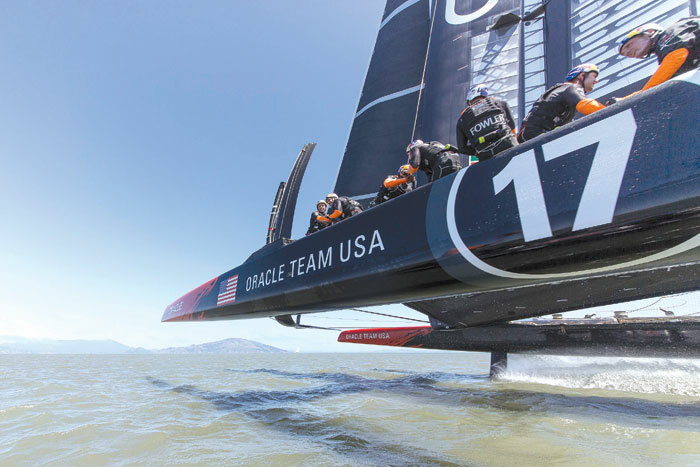 That race, which was a runaway for Emirates Team New Zealand even before it hit the stating line on San Francisco Bay, was the first time in four races since the challenge series began that two wing-sailed AC72 catamarans were racing on the course at the same time. Kiwi skipper Dean Barker trapped Italy’s Luna Rossa during the pre-start maneuvers and then accelerated, gaining a five-length lead approaching the starting line perpendicular to the Golden Gate Bridge. Team New Zealand’s winning margin was 5 minutes, 23 seconds, but Luna Rossa was officially tagged with a “did not finish” (DNF). Boats must finish within five minutes of the winner or be ruled a DNF. That’s because there will be two races a day during the Louis Vuitton Cup finals for challengers and the America’s Cup match, and officials want to keep the program running on schedule. The race for the America’s Cup has had a trouble start. To begin with, only four teams — three challengers: New Zealand, Sweden and Italy; and the defending team: Larry Ellison’s Oracle Team USA — have entered, instead of the eight or nine challenging teams that were originally expected. Race organizers blame lean economic times for deterring potential sponsors from spending the $100 million it costs to mount a competitive campaign in the 34th America’s Cup. Then, one of Oracle’s catamarans capsized Oct. 16, 2012 during a practice run and was swept under the Golden Gate Bridge, prompting a rule change to make the boats more stable. Another capsize during a practice run May 9 that damaged Artemis Racing’s boat and killed crewman Andrew “Bart” Simpson prevented the Swedish team from participating in the Louis Vuitton challenge series, which runs through August. It is unlikely that Artemis will be ready to compete with its new boat until the Louis Vuitton Cup semifinals in early August. The accident that killed Simpson led regatta director Iain Murray to make 37 safety recommendations, including changes to the winglets on the rudders that he said would make the catamarans more stable. Luna Rossa and Team New Zealand protested, saying Murray didn’t have the authority to unilaterally change the rules. A five-member jury from the International Sailing Foundation sided with New Zealand and Italy in their arguments that Murray overstepped his authority in making the rule changes. Italy had boycotted the July 7 opening race of the challenger series with New Zealand while awaiting the international jury’s decision. Team New Zealand sailed around alone to collect a point. Team New Zealand sailed alone again July 9, as did the Italians July 11, when their scheduled opponent was Artemis Racing. The Swedish-based Artemis Racing has yet to launch its second boat following the capsize of its first boat. Artemis said it hopes to begin sea trials of its second boat before the end of July. Finally, because only three teams have entered the challenger series, which they have sponsored since 1983, Louis Vuitton said that it is paying the America’s Cup $3 million less than originally agreed to sponsor the challenger trials. Vuitton said that it would have paid the full amount originally contracted if at least five challengers had entered. The winner of the Louis Vuitton Cup is scheduled to face defending champion Oracle Team USA in the 34th America’s Cup, beginning Sept. 7. — Associated Press and The Log News Service reports were used in this story.